This is Kung Pao. And no, I didn’t give him that name. In fact, I have a habit of naming cats after characters from old movies. So knowing what I do about him now, I’d probably call him Sheridan Whiteside. From The Man Who Came to Dinner. If it was my choice, that is. But it wasn’t my choice, because Kung Pao wasn’t even supposed to be my cat. He was named by Caroline. She bought the house across the street and moved in eight years ago. Right about that time, Kung Pao and his sister were abandoned at the local homeless shelter, where Caroline worked. Being both a kind soul and a new homeowner with some extra space to share, Caroline decided to adopt them. Soon after, Kung Pao set up housekeeping in our backyard. At night he bedded down under the eaves, in the corner of a planter which happened to be right next to the bedroom slider. To my amazement, he slept there even on the coldest winter nights. So I made him a proper bed from a plastic storage box, filling it with a cozy quilt and cutting the lid in half so he’d have easy access. My husband used to joke that Kung Pao lived with us 23 hours a day, only returning home for meals. Who knows why Kung Pao preferred it here? I suspect he had a rough life before Caroline adopted him, and we had a space where he could roam a bit but still feel safe and enclosed. Not to mention a bevy of kindred kitties. Maybe he found his people here. I like to think he was the cat version of Heidi back then, coming to recuperate in the Swiss Alps of our backyard, getting stronger and healthier every day. Whatever it was, we continued like this for years. And all seemed well. That is, until the “for sale” sign appeared on Caroline’s lawn in 2006 (smart cookie, that Caroline, to sell before the housing market took its long and painful dive). Caroline was headed, literally, for the greener pastures of Salem, Oregon. So what did I do? I panicked. I hate to admit it, but a part of me hoped she wouldn’t be able to sell her house! Because it seemed awfully presumptuous of me to ask her to give me her cat. But it wasn’t like that at all. When I finally got the nerve to remark to her, “Well, you know, they say a cat sometimes chooses you,” Caroline was gracious and grateful. She told me she hoped I would ask, because clearly this was home for Kung Pao. And here we are, three years later. Kung Pao lives inside most of the time now, and fits in well with the rest of the brood. Of course, he will always be somewhat timid and easily frightened. Yet, he has a kind of wisdom that reminds me of the eccentric Southern characters in Tennessee Williams’ plays. Like in the photo above. Every single day, after his evening meal, he saunters out to the glider to sit for a spell in the fading light. He tidies himself up. Gazes at a wandering bee or bug. And becomes very still and serene. I’m convinced that if he could, he’d pour himself a cup of elderberry wine and light up a pipe. Perhaps, because he’s been to the dark side and back, he has an innate understanding of the meaning making power of daily rituals. The small daily ritual. A few moments to get grounded. An in-between space in the forward movement of our days. Okay, I’ve done each of those things some of the time, but not near enough to proclaim them as rituals. So I laugh at the notion that here is this cat, with a brain the size of a peach, who has figured out how to do daily rituals when I’m still woefully lagging behind! But I know I’m not alone. I know I’m in good company, and many of us struggle to weave these small daily wonders into our lives. So next year, I’m taking a page from Kung Pao’s book. I have a feeling if I let my eccentricities roam just a tiny bit more, I’ll soon be joining him on the glider as often as I can. What about you? What do you know about small daily rituals? Or cats? Or anything, for that matter? Share your thoughts here and let’s start a conversation. Cats are good with their rituals. Our cat Gus (who looks almost exactly like Kung Pao) has a nightly ritual of searching the house each night. Like a little night watchman on patrol for anything out of the ordinary. He even opens the bifold doors of the pantry and closets and the lower doors of the kitchen cabinets. You may find it interesting that like your old movie naming, he was named after the mouse in Cinderella. “Now for a name. I’ve got one! Octavius. But for short, we’ll call you Gus.” His personality is actaully quite similar to that fat little mouse. Gus sounds like quite a character, Eric. I had a cat once who had that same kind of nightly ritual, like it was his job to carry out each and every day. Thanks for sharing that! This was an AWEsome post! What strikes me most is that this cat is your teacher. When we really look at nature as you do, lessons become so apparent. The simplest and most profound things can be learned and the wise Native Americans were really into this. I don’t have cats due to allergies but I swear my dog teaches me to live in the moment, as he does. I’m glad he lives with me because it seems I need this reminder daily! Hi SuZen – Why thank you! So nice of you to say. You’re right, he is my teacher. I think, actually, that all my animals have taught me things. I like what you say about your dog too. Somewhere I heard it said, “for a dog, it’s never a bad time.” Meaning that they’re always ready to do anything – walk, fetch, get pets, etc. That’s inspiring. A lesson from a cat. My cat sunny was oneof the major contributors to me deciding to stop drifting through life and create the life I wanted. Several months ago i came home from a quick fast food run to find him that he had been injured, i took him to the vet even thought i knew i could not afford it and had to start calling around to find someone to loan me the money to help heal my kitty. I realized in those tense moments that I had to do better not just for him but for my self. It turned out that he had fallen off the roof and broken his jaw, he is ok now but every day i see him i am reminded of that night and use that to keep trying to be a better person. Oh, Quinn, what a wonderful story. I’m so glad Sunny is okay. And in that moment you speak of, you really came through for both Sunny and yourself. Sounds like this was one of those wake-up calls. And the thing about those is, it can be hard to remember the insight once the wake-up call is passed. But you have certainly done that, so big points to you. Thanks for bringing that story here. It’s funny how we can learn from the animals in our lives. I have a dog that forced me into a ritual. She bullied me into taking a walk every single night. If we don’t go for a walk she will whine at the door at 1am, 3am and 5am. The thing is I’m so glad she forced me to make this a ritual. I never would have gone for a walk every single night. Now I can’t go without that walk. I need to to regulate my stress. Thanks for making me realize this. Hi Karl – How nice to see you over here! I remember seeing your dog on one of your Friday videos. She’s beautiful. And I like the point you make – that we start doing something that we have to (or the dog keeps waking us up) but then we realize that we really need it. We like it. The best kind of ritual. Thanks for sharing that story. Thank you for this wonderful post. And thank you for opening your home and heart to Kung Pao. Like you had a choice, right? “Sheridan Whiteside” is definitely the name for KP! My own “take-ins” have been dogs and, like Karl’s dog, have schooled me in the joys of the daily walk. Without the canine(s), though, I know I’d be less faithful. Hi Lynda – Welcome! Thanks for stopping by. You’re so right about KP – like I had a choice! And I love how you say this – “schooled me in the joys of the daily walk.” These animals really are our teachers, aren’t they? I really appreciate your comment. Hi Amanda – Great point. They do seem to have a keen sense of time. Maybe because they’re hooked into the natural rhythms of life? Oh Patty, your story took me to your back yard and I watched the ritual with you. I too think rituals are a way to ground us and to help us do certain things we other wise would not do. And I better choose good ones too AND sometimes I have to watch when a certain ritual no longer serves me and I keep doing it. Like a long time ago smoking had something of a ritual in it for me. I enjoyed that rolling my own cigarette gave me a chance to stop what I was doing and to just take a breather. It was that ritual feeling that I missed most when I gave it up. Interesting to think of it this way, thanks Patty. Oh what an interesting insight, Wilma. I think so much of what we do that’s not the best choice is related to the ritual itself. Something like smoking gives us an excuse to take the time for that ritual. Because here in the states, we are not so good at that. Thanks for the comment! What a wonderful post and what a beauty that Kung Pao is! I had a cat once in high school who I had to leave when I left for college. I didn’t think I was a cat person but found I couldn’t say no to taking care of her. She taught me a lot about about affection. As for my rituals, I have a few that include my son. But the ones that are just for me, I have to have quiet time first thing in the morning or late at nite for some reading and writing. And lots of hot tea. Hi Belinda – Ah, lovely point. Now that you say it, I too think my cats have taught me boatloads about affection. And unconditional positive regard. Mmmm, hot tea. I have finally been doing that in the evening with more regularity. I will send good thoughts your way the next time I sip my Earl Gray! What a beautiful post and picture, Patty. We are once again in the same place. As you know, I just posted a poem by Garrison Keillor about his beloved cat, Ralph. It’s very touching indeed. I have never been much of a cat person really, but I appreciate all living things. My mother loved her cat growing up; we had dogs. Your cat is beautiful. Hi Judith – Yes, isn’t that cool that we are having these serendipitous posts? I will relay your compliment to Kung Pao. My husband keeps telling him that he’s famous now, but he seems to pay it no mind. Thanks for stopping by! I always, always brush my teeth! and floss!….the rest of life I get through with changes nearly everyday. I embrace change as the ritual because with three children life growing is about change – everyday. Hi Patricia – Welcome, thanks for stopping by. Sounds like blogging and blog visiting is indeed an enjoyable ritual for you. How wonderful for you to have discovered it. And thank you for your very kind words. You have gained much wisdom from your observations of this creature whom seems to have the world all figured out. Rituals are very important, they help create balance and keep us grounded. Rituals help us to alleviate stress. You are wise to follow suit and develop your own rituals of quiet time and reflection. Thanks for sharing. Hi there – How nice of you to stop by – welcome! Yes, rituals do certainly alleviate stress. I also find they deepen my experience of life. Thanks! 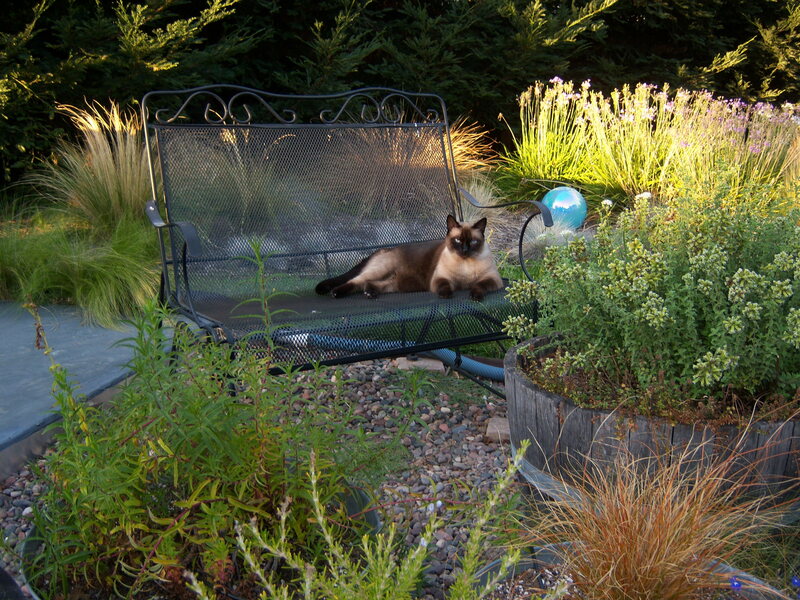 My sister, who was a soft, purring cat in a previous life, had a siamese cat who she was madly in love with. I adore cats but unfortunately we can’t have anything furry come within five miles of my husband due to his allergies. I fell into your story with your wonderful descriptions. Thank you for reminding me that animals bring us closer to nature. We are thinking of getting a dog in the spring and although I know that it might push me over the edge I am hoping that it will bring a new spirituality to our home. Hi Jillian – Thanks so much. And I hear you about the dog. Animals truly do bring us closer to nature, as you say, but it can feel pretty overwhelming if you are solely responsible for their care or you’re trying to housebreak a new puppy. So I definitely hope you can figure out a way to do it without getting pushed over the edge! You need to take care of yourself first. What a great cat story. I like where you say he found his people! That just makes me smile. I don’t have pets. I think it’s because being one of 10 our family didn’t have pets. Then getting married so young and being mom to 4 daughters by 22 I just thought of pets as more work. Today I have time and still don’t have pets. So I truly enjoy hearing pet stories because I don’t have any pet stories. About the ritual…I love your list. I like the new coffee house idea. I have an elderly friend who physically can’t do much and I’m very active. I think this would be a fun thing we could do together, find a new coffee house! Thanks for the idea, it could be our new ritual as her health is only getting worse. I know she must feel left behind. Happy Holidays! Oh, Tess, that would be a wonderful experience to help your friend feel part of things. She (or he) is lucky to have you as a friend! Pingback: Meaning Mondays: The Teapot Edition « Why Not Start Now?